FRANKFURT -- BMW said global sales of the company's core brand rose 13 percent to 107,359 units last month, as continuing strong demand in China and the United States and the success of the new 3 series helped lift sales. The rise puts BMW ahead of Mercedes-Benz, whose sales grew 20 percent to 95,647 in February. Rival Audi has yet to release sales figures for last month. BMW is currently the best-selling premium carmaker in the world. "February was another record month for the BMW Group and we intend to continue the positive development. 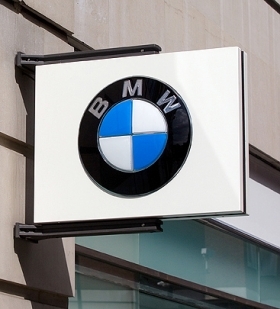 We aim to exceed our 2011 record sales in 2012 and to maintain our position as the number one premium car company worldwide," BMW head of sales Ian Robertson said in a statement Wednesday. BMW Group sold 1,668,982 vehicles globally last year. In the first two months of 2012, overall sales of BMW Group vehicles, including the Mini and Rolls-Royce brands, grew 11 percent to 239,800 units. In February, the group sold 127,634 vehicles, a rise of 14 percent. Sales of the new-generation BMW 3 series, which was launched worldwide in mid-February, has helped boost sales for the automaker, with incoming orders "exceeding our expectations," BMW said. Demand for BMW's X3, X1 and 1-series models also helped boost February deliveries for the automaker. Sales of the revamped X3 SUV rose 50 percent to 11,053 units last month, while sales of the smaller X1 grew 20 percent to 9,059 units. The company sold 12,950 units of its 1-series compact in the same period, a rise of 41 percent. In February, the group's Mini brand sold 20,020 cars, a rise of 25 percent over last year's figures. Boosted by the success of the Countryman, Mini sales since January have increased 19 percent to 35,788 units. In the United States, the company's biggest single market, the BMW Group reported sales of 26,184 vehicles last month, 32 percent more than a year earlier. Sales in China, BMW's second-largest market, jumped 39 percent in the same period to 22,916 deliveries. But at home in Germany, BMW's third-biggest global market, growth was stagnant in February, with sales of 18,219 cars, 661 less than the year before. Overall sales in BMW's European market were flat at 57,434 units last month as the region continued to suffer a drop in consumer confidence caused by widespread economic problems.